Chiropractic is a health care discipline dating back to 1895. At that time, D.D. Palmer delivered a spinal adjustment to a man with nerve deafness, Harvey Lillard. As a result, Mr. Lillard's hearing was restored and Chiropractic was born. Chiropractic is a science soundly based in anatomy and physiology. Inside our body is a spinal column of 7 neck or cervical bones (called vertebrae), 12 thoracic vertebrae, 5 lumbar vertebrae, a triangular bone called the sacrum, and the tail bone called the coccyx. 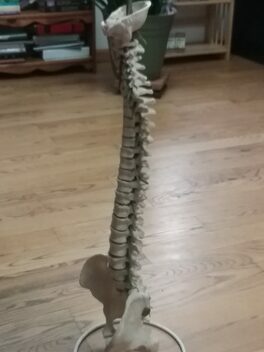 This vertebral column surrounds and protects the spinal cord. The spinal cord is part of the central nervous system and carries information to and from the brain. It tells the brain exactly what is going on the cellular level within the body and brings from the brain the power to accomplish whatever needs to be done. In between each of the vertebrae is a space for individual spinal nerves to exit and enter. When the body is traumatized as by an accident, a fall, or even constant poor posture (student, secretary, computer operator), muscles that attach to the vertebrae go into spasm, ligaments stretch or tear, causing a restructuring of the spine. This restructuring distorts the proper spinal angles and vertebral positions. As a result, the spaces between the vertebrae are altered causing irritation to the nerves. In chiropractic, we call this vertebral subluxation complex. If somebody twisted your wrist, how long would it take before your hand would hurt or become numb and tingly? A similar process happens at the spine. Wherever the nerve travels will be affected. There may be hyperactivity or hypoactivity. If the nerve is connected with the bladder, you'll either have frequent urges to urinate or hardly ever have an urge. If the nerve is connected with your arm, you'll have pain from spasm, weakness from muscles not functioning. The nerve always feeds the immediate area of the spine causing pain or tenderness in that area. In short, the nervous system must be kept clear of interference for the body to function. Distortion of the spine creates blockage in the nervous system causing dysfunction in the body. You can surely understand that if subluxation is left uncorrected, the usual course is DYS-FUNCTION ... DIS-EASE ... DEATH. As chiropractors, we locate areas of spinal distortion and malpositioning by physical examination and x-rays and correct these areas of vertebral subluxation complex. The procedure we use is called an adjustment. There are many techniques available to accomplish this end. Some doctors of chiropractic use their hands, some use instruments. The one thing all chiropractors have in common is the striving to achieve correction of vertebral subluxation complex. Chiropractic as a profession is dedicated to wellness. The body always wants to heal itself of all injury and ills. Vertebral subluxation complex produces interference in this process. As correction is accomplished, healing occurs... naturally.